You may download a PDF copy of the Cooleemee Proposed Budget Worksheet. We look forward to your feedback. On Saturday, April 30, 2016 from 8:00 AM until noon, electronics will be collected for free recycling at the landfill located at 360 Dalton Road in Mocksville. Items that will be collected include PCs, hard drives, laptops, televisions, keyboards and mice, servers, cell phones, PDAs, video games, iPods and MP3 players, network equipment, consumer electronics, scanners, printers, copiers, GPS units, typewriters, telephone systems, rechargeable batteries and ink and toner cartridges. There are other recycling options for many of these items, and working electronics can still be donated to Goodwill. Davie County will offer two additional electronic collection events on the last Saturday of the first month in each calendar quarter. Free electronic recycling days will be held at the same location July 30, 2016 and October 29, 2016. Remember, it is illegal to dispose of televisions, computers, printers, video games and other electronics in the landfill. These items must be recycled. The letter below appeared in the Letters to the Editor section of the February 18, 2016 edition of the Davie County Enterprise and is republished below with permission. Please click here for a printable copy of the original document. The Town Councils of Bermuda Run, Cooleemee and Mocksville are strongly opposed to the County’s proposal to change the method of sales tax distribution from the Per Capita to the Ad Valorem method. The change would take money away from the Towns and give it to the County. Mocksville would lose $377,000 (22% of its budget), Bermuda Run, $273,000 (28% of its budget), and Cooleemee, $150,000 (35% of its budget). The three towns would have to raise taxes significantly or reduce essential services. The change will harm economic development initiatives. A majority of the largest taxpaying companies are located in the Towns where there is commercial activity. An additional tax in the Towns would threaten the success of our economic development program, which has created new jobs and reduced the pressure to raise taxes. The change is driving a wedge within the County. The Towns are part of Davie County, and each citizen in the Towns pays the same tax rate as a citizen in the unincorporated areas of the County. Plus, Town citizens pay an additional tax that pays for their core government services. Is it fair and equitable to shift the burden of the County’s financial problems to the citizens of the Towns? The County is asking that the Towns, which make up 20 percent of the County’s population, shoulder 100 percent of the burden of the County’s financial challenges. The County is asking the Towns to bail them out. The current Per Capita distribution method has been in effect in Davie County for 40 years. Out of the blue, the County wants to change it. Why and why now? Why is the County not willing to discuss the financial dilemma openly with the Towns to find a more equitable solution? Davie County is one economic unit, and we will rise or fall together. The people of Davie attend the same schools, shop in the same stores, worship in the same churches, and likely will be buried in the same cemeteries. Surely, we can come together to make the best decisions on a sales tax issue. 4th of July Lawnmower Parade! Word had not yet reached the Forks of the Yadkin that North Carolina and the other twelve American colonies had declared their independence from England two hundred and thirty-nine years ago. After they won, though, July 4th became the day to celebrate that hard-fought battle as well as the liberties and freedoms that independence bestowed upon us. Since the 1990s, Independence Day is honored by a Lawnmower Parade that begins at Cooleemee School. 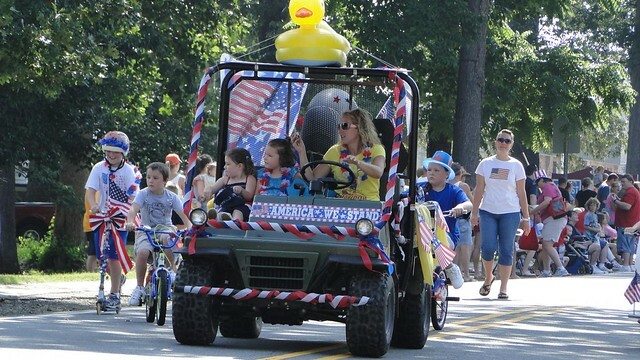 Anyone can participate by lining up a patriotically decorated lawnmower, float, car, bicycle or pet by 9:30 AM on Saturday, July 4th. Judges will be in the crowd and there will be prizes to win at the parade’s end on the Zachary House grounds. Bring your lawn chair and view the parade along Marginal Street. As always there will be free watermelon for all under the arbor. Hot dogs and cold drinks will be for sale at the Cook Shack and historic displays about the American Revolution in the Forks of the Yadkin will be on view on the patio. The July 4th activities are sponsored by the Town of Cooleemee. Patriot militia Captain Richmond Pearson is buried just a little over a mile from Cooleemee. His final resting place, with impressive stone quarried walls, was restored by Del McCullough and Terry Dedmon in 2000. It is maintained by the Cooleemee Historical Association. Pearson’s militia unit trained at Veach’s muster ground near where Liberty United Methodist Church now stands. From behind trees, they harassed Gen. Cornwallis’s army through the local woods on their way to battle American General Nathanial Greene’s forces at Guildford Courthouse. Meet and Greet with Cooleemee’s New Recreation Director! Please help us welcome Wendy Marion into her new job as the Cooleemee Recreation Director! Wendy is excited about the opportunity to serve all of the families in Cooleemee and this is your opportunity to shape the future of the Cooleemee Recreation Department!